In this Tuesday, June 30, 2015, file photo, flags fly over ConAgra Foods world headquarters in Omaha, Neb. Conagra is recalling some Hunt's tomato paste cans due to the possibility of mold. The company said that the recall is for six ounce cans of Hunt's Tomato Paste No Salt Added. It said that after the canning process, the final product could have been damaged, creating the potential for mold. It became aware of the issue from consumer calls. The recalled cans have a best by date of Oct. 16, 2020 and an Item UPC of 00-0-27000-38807-5. No other Hunt's products or Conagra Brands' products are impacted by the recall. Conagra said that it told the Food and Drug Administration about the recall and is working to make sure the recalled cans are removed from store shelves and no longer distributed. Consumers are advised to either throw away the product or return it to the store they originally bought it from. 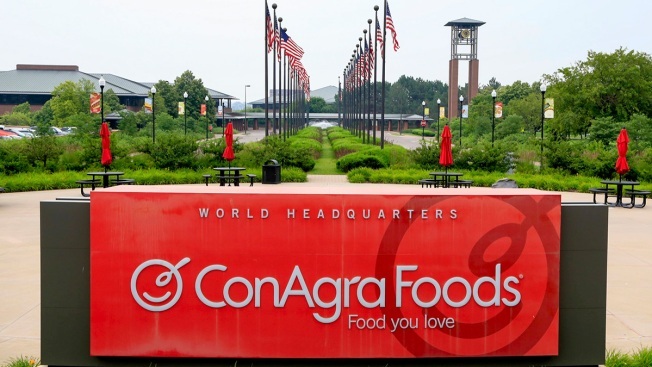 Anyone with questions can call Conagra at 1-888-280-0301 from 9 a.m. to 5 p.m. ET, Monday through Friday or visit https://www.hunts.com.